For the publisher, see Small Beer Press. Small beer (also known as small ale or table beer) is a lager or ale that contains a lower amount of alcohol by volume (ABV) than other beers, typically between 0.5% to 2.8%. Sometimes unfiltered and porridge-like, it was a favored drink in Medieval Europe and colonial North America against more expensive beer with higher alcohol. Small beer was also produced in households for consumption by children and servants. Before the 19th century, drinking water had the potential to make one sick because of poor sanitation. Practical experience showed that fermented beverages were less likely to produce illness. At mealtimes in the Middle Ages, everyone could drink small beer, including children, while eating a meal at the table. Table beer was around this time typically less than 1% ABV. It was common for workers (including sailors) who engaged in heavy physical labor to drink more than 10 imperial pints (5.7 litres) of small beer during a workday to quench their thirst. Small beer was also drunk for its nutrition content; it might even have bits of wheat or bread suspended in it. Erasmus Darwin, in his A Plan for the Conduct of Female Education, in Boarding Schools of 1797, thought that "For the drink of the more robust children water is preferable, and for the weaker ones, small beer ...". Larger educational establishments like Eton, Winchester, and Oxbridge colleges ran their own breweries. In 17th century England, it was an excise class which was determined by its wholesale price. From 1782 to 1802, table beer was defined as that which cost between six and eleven shillings per barrel and the duty on this class was three shillings. Cheaper beer was classed as small beer while the more expensive band was classed as strong beer. The distinction between small beer and table beer was removed in 1802 because there was much fraudulent mixing of the types. The whole scheme was abolished in 1830, when it was replaced by a malt tax. Small beer was seen as acceptable in 18th-century England because its low alcohol content allowed people to drink several glasses without becoming intoxicated. William Hogarth's portrait Beer Street (1751) shows a group of happy workers going about their business after drinking table beer. It became increasingly popular during the 19th century, displacing malt liquor as the drink of choice for families and servants. Small beer and small ale can also refer to a beer made of the "second runnings" from a very strong beer (e.g., scotch ale) mash. These beers can be as strong as a mild ale, depending on the strength of the original mash. (Drake's 24th Anniversary Imperial Small Beer was expected to reach above 9.5% abv.) This was done as an economy measure in household brewing in England up to the 18th century and is still done by some homebrewers. In Belgium, small or table beer is known as tafelbier and there are many varieties are still brewed. 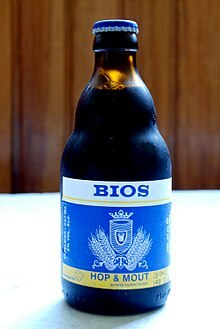 Breweries that specialised in this type included De Es of Schalkhoven and Gigi of Gérouville in Luxembourg. In the US, a Vienna lager was a popular table beer before prohibition. Metaphorically, small beer means a trifle, or a thing of little importance. "Small ale" appears in the writings of William Shakespeare, William Thackery's Vanity Fair, and in Ellis Peters' Brother Cadfael series, and "small beer" appears in Thackeray's Barry Lyndon. Graham Greene used the phrase "small beer" in the metaphorical sense in The Honorary Consul. When David Balfour first meets his uncle Ebenezer in Robert Louis Stevenson's novel Kidnapped, Ebenezer has laid a table with his own supper, "with a bowl of porridge, a horn spoon, and a cup of small beer". The small beer, along with the porridge, indicates Ebenezer Balfour's miserliness, since he could afford much better food and drink, but it may also be meant to convey the "trifle" meaning as an indication of Ebenezer's weak, petty character. In the song "There Lived a King" in the Gilbert and Sullivan comic opera The Gondoliers, small beer is used as a metaphor for something that is common or is of little value. Small beer is eaten with breakfast by "prentice-lighters" in D.M. Cornish's Monster-Blood Tattoo. Thomas Thetcher's tombstone at Winchester Cathedral features a poem that blames his death on drinking cold small beer. Benjamin Franklin attested in his autobiography that it was sometimes had with breakfast. George Washington had a recipe for it involving bran and molasses. ^ "Foods of England". Retrieved 23 February 2017. ^ a b c "Ex-Sipsmith Gin Duo Launch "First" Brewery Dedicated to "Small Beer"". The Drinks Business. 27 November 2017. Retrieved 25 March 2018. ^ "What Is Table Beer, the Beer We've Been Seeing Everywhere?". Bon Appettit. 28 August 2017. Retrieved 25 March 2018. ^ Peter Mathias (1959). The Brewing Industry in England 1700–1830. Cambridge University Press. p. xxv. ^ "Drake's Brewing Co. reveals 24th and 25th anniversary beers". BeerPulse. Retrieved 6 November 2013. ^ Alicia Underlee Nelson (2017). North Dakota Beer: A Heady History. Arcadia Publishing. p. 38. ISBN 978-1-625-85919-8. ^ W.S. Gilbert (1889), The Gondoliers (PDF) .